VietNamNet Bridge - Provincial authorities in the central region have decided to withdraw proposed hydropower projects in an effort to protect forested land. Gia Lai province, which initially planned to develop 74 small hydropower plants, has eliminated 17 of the projects. These include Thac Lo O project with a capacity of 0.25 MW and Smla 2 with capacity of 0.6 MW. The provincial authorities have also stopped the operation of Kanak hydropower plant (0.18 MW) and Ia Kha (0.225 MW). 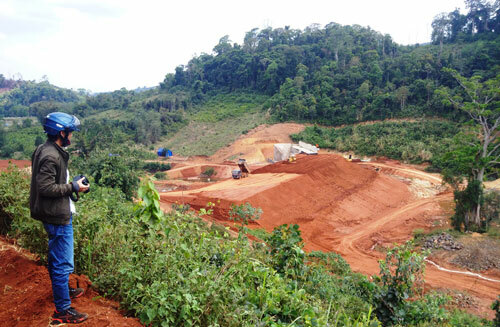 During construction, the dam broke twice at the Krel 2 hydropower project in Gia Lai province. Authorities stopped the construction and revoked the project’s license. Resident Ro Cham H’Pinh in O Hamlet in Ia Dom Commune said she was relieved to hear the news because she was afraid of being washed away by floods. In September 2016, when she and her brothers were sleeping in a hut, the flood water from Krel 2 rushed down and nearly swept them away. They had to climb up trees and wait for border guards to rescue them. A report from the Dak Lak provincial authorities released on July 18 said that 13 out of 22 hydropower projects and 71 out of 79 potential spots for hydropower plants have been eliminated. The 22 hydropower works were approved by the provincial authorities in 2005. However, realizing that many of them will have negative impact on the forests, the province asked MOIT to remove the projects. These included Drang Pok which had expected capacity of 26 MW. Drang Pok is located in the core area of the Yok Don National Park in Buon Don district. If the hydropower plant is built, it would take away tens of hectares of forests in the core area. Scientists warned the project will have major adverse effects on the natural environment as well as biodiversity. Dak Lak has also decided to eliminate Buon Bra project. Vu Trong Hong, former Deputy Minister of Water Resources, has said many times that small hydropower plants cannot make a contribution to the national grid, and could cause a significant negative impact on the environment. He said the central provinces including Quang Nam province don’t need more hydropower plants. In principle, the investors have to afforest to compensate the plants they chop down. However, no one has done this.